An American Spa™ will probably be one of the best investments you'll ever make, but before you bring one home there are a few things to consider. 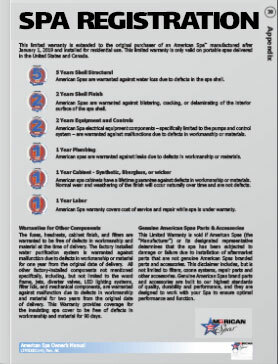 This handy guide has been designed to provide you with all the information you'll need to ensure a safe and easy American Spa™ delivery and installation. Click the DOWNLOAD button to the left to read the guide now to ensure your home is ready for a American Spa™! Read this before you start up your new American Spa™! Learn how to avoid common but easy to avoid problems with our Quick Start Guide. 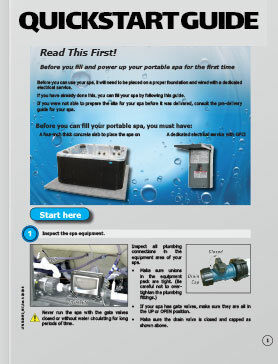 This is specially designed for first time spa owners. From filling your spa to priming it correctly, it's all here on one simple sheet. Click the DOWNLOAD PDF link below and you'll know how easy it is to start your spa with just a little bit of knowledge and preparation. Read everything you need to know about owning your very own American Spa™. Want to know how to change the temperature? Is the water level right? Just need something to read while you're relaxing? No problem! The Owner's Guide is here to help. Just click the DOWNLOAD button to the left and all of your questions will be answered. Need more information? Contact us! 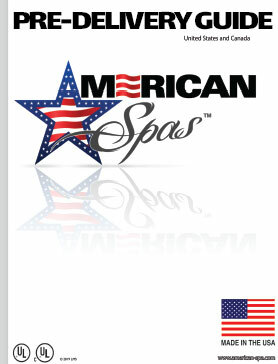 AN AMERICAN SPA&TRADE; WILL PROBABLY BE ONE OF THE BEST INVESTMENTS YOU'LL EVER MAKE. BEFORE YOU BRING ONE HOME THERE ARE A FEW THINGS TO CONSIDER. THIS HANDY GUIDE HAS BEEN DESIGNED TO PROVIDE YOU WITH ALL THE INFORMATION YOU'LL NEED TO ENSURE A SAFE AND EASY AMERICAN SPA&TRADE; DELIVERY AND INSTALLATION. CLICK THE DOWNLOAD BUTTON TO THE LEFT TO READ THE GUIDE NOW TO ENSURE YOUR HOME IS READY FOR AN AMERICAN SPA&TRADE; ! BEFORE YOU BRING ONE HOME THERE ARE FEW THINGS TO CONSIDER. THIS HANDY GUIDE HAS BEEN DESIGNED TO PROVIDE YOU WITH ALL THE INFORMATION YOU'LL NEED TO ENSURE A SAFE AND EASY AMERICAN SPA&TRADE; DELIVERY AND INSTALLATION. CLICK THE DOWNLOAD BUTTON TO THE LEFT TO READ THE GUIDE NOW TO ENSURE YOUR HOME IS READY FOR AN AMERICAN SPA&TRADE; ! READ EVERYTHING YOU NEED TO KNOW ABOUT OWNING YOUR VERY OWN AMERICAN SPA&TRADE;. WANT TO KNOW HOW TO CHANGE THE TEMPERATURE? IS THE WATER LEVEL RIGHT? JUST NEED SOMETHING TO READ WHILE YOU'RE RELAXING? NO PROBLEM! THE SERIAL NUMBER OF YOUR SPA IS LOCATED ON A METAL PLATE ATTACHED TO THE LOWER RIGHT FRONT PANEL OF THE SPA. YOU WILL NEED THIS NUMBER TO PROPERLY REGISTER YOUR SPA AND ACTIVATE COVERAGE.